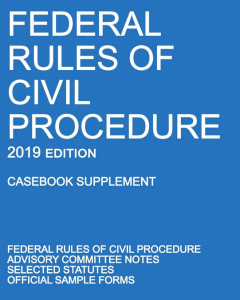 Federal Rules of Civil Procedure (2019 Edition) with the full Advisory Committee Notes, selected statutes (venue and jurisdiction of federal district courts, along with removal from state courts), and all official forms for civil suits in federal district courts. This 2019 edition includes all amendments to the Federal Rules of Civil Procedure through January 1, 2019, including the latest Advisory Committee notes. Perfect for the law student or practitioner who needs the full rules, explanatory notes, statutory reference, and official example forms.